Chiku is a tropical fruit. It has an uncanny resemblance to a kiwifruit in color and skin texture, except the chiku is slightly larger and without the hairy feel, but rough. The rounder variety which I planted does not look like kiwifruit except for the color. Chiku is spelt differently in different countries, but retaining the same pronunciation. Other names for chiku are sawo (Indonesia), sapota (part of India), lamoot (Thailand, Laos and Cambodia), sapote, sapodilla, zapote, sapoti, nispero, dilly, naseberry, chicosapote, and many other names. In Malaysia, we called it chiku. Its scientific name is Manilkara zapota. The chiku is native to Mexico, Central America and the Caribbean. It was first introduced to the Philippines by the Spaniards. Now the chiku is a common fruit in South East Asia, India and Pakistan. The tree can grow to a height of 30 meters (100 feet) high. However a grafted plant can be controlled to a low height. I have one grafted chiku tree which is less than 10 feet high with controlled pruning. Take a look at the picture below. The tree is very hardy. I planted this chiku tree as a replacement for the rambutan tree which did not survive. I am completely satisfied with this chiku tree as it fruits easily throughout the year, although the fruits take a long time to ripen. The flowers are minute and white in color, not attractive at all. 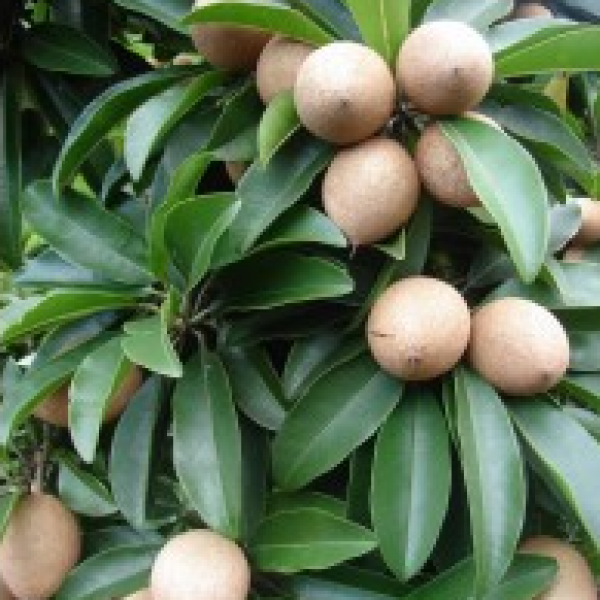 Manilkara zapota, commonly known as the sapodilla is a long-lived, evergreen tree native to southern Mexico, Central America and the Caribbean. An example natural occurrence is in coastal Yucatán in the Petenes mangroves ecoregion, where it is a subdominant plant species. It was introduced to the Philippines during Spanish colonization. It is grown in large quantities in India, Thailand, Malaysia, Cambodia, Indonesia, Bangladesh and Mexico. Sapota, popularly known in India as chiku. In India it is cultivated for fruits which are liked all over the country. The fruit is a fleshy berry, variable in shape, size and weight (75-150g). The skin is thin, rusty brown somewhat scurfy looking like Irish potato, and the pulp soft, melting, crumbling with a sandy or granular texture with 1-5 hard, black seeds. Get in touch with us for small quantities for your rear garden, kitchen garden, home garden or large quantities for farmland development, fruit orchards, fruit farms, real estate layouts or commercial cultivation. As with most fruits, chiku has lots of beneficial nutrients and minerals. Chiku has a special compound called tannin which has anti-bacterial, anti-parasitic and anti-viral properties. It has large amounts of vitamin A, vitamin B and vitamin C. Vitamin A is good for the eyes , strengthening eye vision. Vitamin B helps to overcome fatigue and stress. And everyone knows the benefits of vitamin C, chief of which is strengthening of the immune system. Chiku contains lots of dietary fiber. Fiber helps prevent and also relieve constipation. Fiber also helps to maintain HEALTHY WEIGHT and lowering the risk of diabetes and heart disease. Main minerals found in chiku are copper, niacin, iron, calcium, and phosphorus. Iron, calcium, and phosphorus are bone strengthening minerals.